When it comes to AMA (ask me anything) sessions, Reddit is normally the go-to platform (unless you’re Mark Zuckerberg). 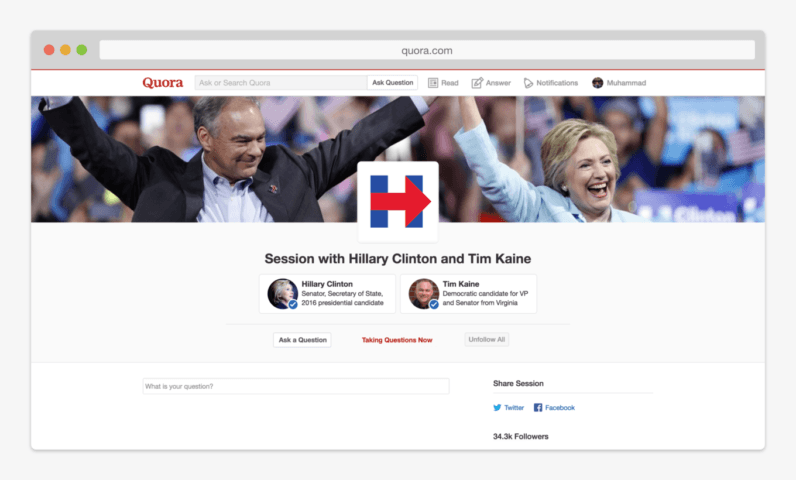 Obama and Trump have both done it, but it seems White House candidates Hillary Clinton and Tim Kaine want to try something new: Quora. Of course, Quora itself is far from new and is great resource for finding answers in general, it’s just not the first choice for direct interactions with public figures. It’s less popular than Reddit, but then Donald specifically chose to host his on a campaign-friendly forum, /r/The_Donald. That said, it did host questions from the White House in 2012, and Tim Kaine has previously participated in Q&A sessions on the site as Senator. Quora is also known for being a bit more respectable than Reddit (or rather, a bit less likely to go south), so it’s a nice change of pace. If Hillary Clinton wins the election, how will she address Trump supporters’ major concerns? Why is college education unaffordable for so many Americans today? What should be done about this? What do Hillary Clinton and Tim Kaine think about Black Lives Matter? What will be Hillary Clinton’s China policy if she becomes the president? What are the top 5 priorities for a Clinton-Kaine administration? The duo will start answering questions next Monday, August 8. Here’s to hoping Quora moderators don’t replicate the Trump AMA and ban thousands of accounts for asking questions they don’t like.